Awaken your senses with these delightful Zesty Orange Cookie Cups treats. 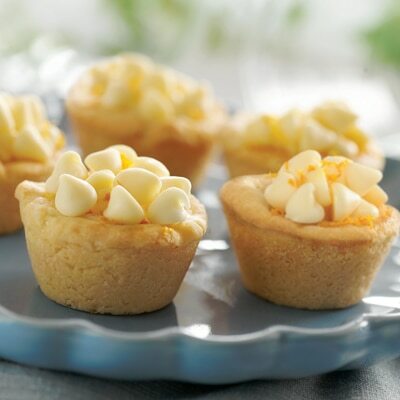 A buttery shortbread cookie cup is filled to the top with a creamy citrus filling, and topped off with our Premier White morsels and a sprinkling of orange zest. Once you place these on the table to share, they won't last for long! PREHEAT oven to 350° F. Grease 48 mini-muffin cups. BEAT butter and sugar in medium mixer bowl until creamy. Add flour; beat until mixture is evenly moist, crumbly and can be formed into balls. Shape dough into 1-inch balls. Press each ball onto bottom and up side of prepared muffin cups to form wells. Place 5 morsels in each cup. BEAT eggs in medium bowl with wire whisk. Stir in sweetened condensed milk and orange extract. Spoon almost a measuring tablespoon of mixture into each muffin cup, filling about 3/4 full. BAKE for 15 to 17 minutes or until centers are puffed and edges are just beginning to brown. Upon removing from oven, gently run knife around each cup. While still warm, top each cup with 8 to 10 morsels (they will soften and retain their shape). Cool completely in pans on wire racks. With tip of knife, remove cookie cups from muffin pans. Top with grated orange peel just before serving. Store in covered container in refrigerator. •	Love lemon but not crazy about orange? Simply substitute lemon extract for the orange extract and use grated lemon peel (2 lemons needed). •	For another variation of this recipe, try substituting 2 cups (12-oz. pkg.) of NESTLÉ® TOLL HOUSE Semi-Sweet Chocolate Morsels for the Premier White Morsels.